An imperfect port of an unambtitious sequel, TFU2 joins the ranks of Star Wars games that don't live up to their potential. How many new Force powers would Star Wars: The Force Unleashed II unleash if Star Wars: The Force Unleashed II could unleash new Force powers? The answer, quite simply – and equally sadly – is one: the sequel adds only a useful-but-unexciting mindtrick ability to on-again-off-again Jedi Starkiller's Force repertoire. OK, so he also gets a few new unlockable outfits and crystals that change the colours and combat bonuses of his twin lightsabers, and he does face some new enemies, but I, for one, came to unleash the Force, not the wardrobe. Even without significant new features, this would've been equally fun to play through as the first game if the story were half as good. But following TFU's well-crafted tale of redemption that fit neatly into the canon between Revenge of The Sith and A New Hope without breaking too many rules, TFU2's is deeply, deeply disappointing. The question of whether you're playing as a resurrected, genuine Starkiller or a test tube-grown knockoff sounds interesting at first, but the story seems to go out of its way to not address it. Driven almost entirely by the weakest aspect of the first game – Starkiller's woefully underdeveloped romantic interest in Imperial Barbie Juno Eclipse – Starkiller literally runs around in a circle while bossing around his supposed mentor, General Kota. Yoda and Boba Fett make brief, pointless cutscene cameos.In the end, after a tedious battle with Darth Vader, you get a choice of a Light or Dark Side ending cinematic. Neither is compatible with existing lore, and one of them even fails to answer the clone question or make any sense. That said, TFU2 does every bit as good a job as the first game of making you feel incredibly powerful when facing battalions of Imperial Stormtroopers. Picking them up and flinging them off of walkways on Kamino, shoving them into the extremely hazardous engine parts of a Rebel starship, roasting them like candy-coated marshmallows with lightning bolts from your fingertips, hacking them to pieces in a flurry of completely unnecessary lightsaberwhirling acrobatics… yeah, that's cool. You really never do get tired of being a Jedi. What does get tiresome is that any foe larger than a Stormtrooper is finished off with an elaborate “quick time event” move (where you push buttons as they're flashed on screen). Sure, watching Starkiller cut AT-STs in half and rip the spines out of General Grievous-inspired battle droids is great fun the first time and probably the second, but there's only one kill animation per enemy type, and the game throws a lot more than one or two of them at you. Inevitably, it becomes repetitive. Where The Force Unleashed II works noticeably better than the original is where annoying things have been stripped out. There are far fewer of the obnoxious camerahijacking boss fights, for example, thank God/the midichlorians. At least Aspyr did a better job of converting LucasArts' console version to the PC than they did on the last one. Performance is great, and there are no longer loading screens between menus. Mouse and keyboard controls feel more responsive and the on-screen cues for QTEs now reflect any key rebinding you do. However, bugs harass at every turn: I had numerous crashes, texture bugs blacked out the scenery after an hour or so of play, and once I had to replay an entire level because a glitch completely halted my progress. More of the same is one thing, but more of not-quite-as-good doesn't cut it. 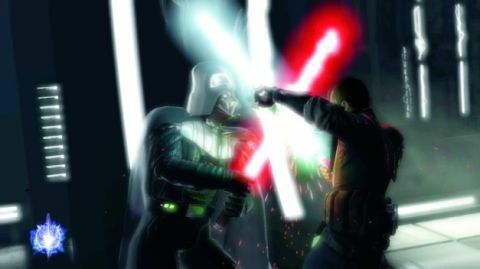 The Force Unleashed II should have been much better.